so the new card Electrodominance is spoiled from the new set and I think there are some ways to break it even in Legacy. Especially in legacy in my opinion. You could for example play a draw 7 spell in turn 1 and this is not that hard maybe. So let's look at some ways to make that happen. then play electrodominance for X=0 and cast Wheel of Fate for free. and some Storm spells and go nuts. Draw 7 Turn 1 in legacy. This can heavily screw up your opponents Gameplan. I played a monored storm deck some years ago and i think this card can work miracles for the deck. What do you guys think. Is it worth a shot? Maybe there are even more crazy Ideas out there, so feel free to post them here. "Master they threatened to darken the sky with their arrows!" "Well, then we will at least fight in the shadow"
"There is no glory to be gained in the kingdom of the dead!" Yeah, but it's really more "Disney Evil" than practical. It's like being a bond villain and giving a monologue rather then just shooting them. Ok, so let's say you play electrodominance into wheel of fate? what else do you run, then? I should think you would want at least one other free way to cast a spell and at least a few more cards that are good to cast with or without electrodominance. What would they be? Of the other zero cmc spells, do you run ancestral vision or lotus bloom? I agree that the card has potential. I am not sure where to take it. The difference with electrodominance is that it can act as a win condition, not just an engabler. Credit to DolZero for this awesome sig! So this is from the top of my head, I never tested it or anything but I can imagine that it could work. I think I would consider the addition of black. I really don't like desperate ritual style effects unless I am running at least 7 cost reduction effects, and cabal ritual and dark ritual are awfully good to be passing up. Additionally, sins of the past as a 1 of isn't a bad card to use to target that wheel of fate/ancestral vision from the graveyard (or whatever other spell you might want to). Today I played some more games. 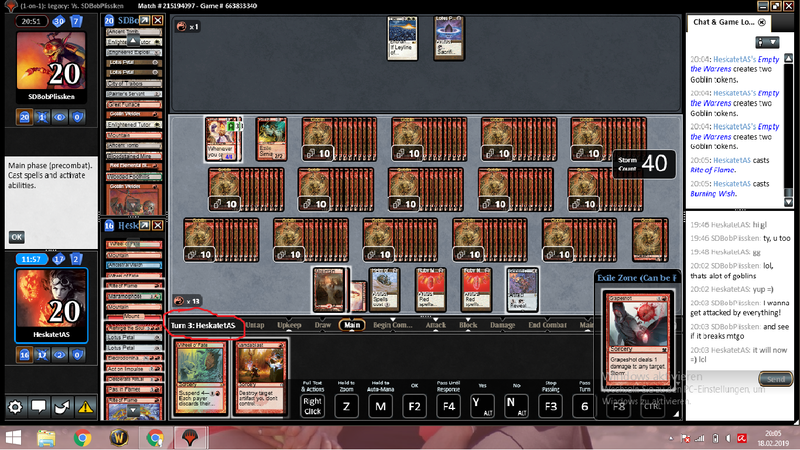 The image shows my 3rd turn against a painter player with active Leyline. still won 2-1. was fantastic. That is an impressive turn 3. How often do you manage to fizzle, though? That is my primary concern for red style storm decks. Red tends to lack the cantrips to smooth out the draws like blue based storm does, though faithless looting goes a long way towards fixing that problem. Well if I went to the combo i never fizzled till now. Tested only something about 20 games at most. The thing is, that this deck is super soft to counterspells. Miracles is a nightmare. But still the deck is really resilient even against hand disruption. It is true that cantrips would improve it alot but i cant see what to replace it with. Furthermore looting is counterproductive, because often you have a hand full of rituals and some way to dig like act on impulse or a draw 7 and you need the cards in a zone where you can play them and with looting you can only play them when you follow with past in flames which is hard to acomplish. I would tend to implement silence and some fetchlands to the deck to thin the deck out and protect your whole combo turn but that brings the problem where to fit that in. Also i could think of an alternate way for a wincon with trash for treasur into a big dude but i can,t imagine which. So there is a new toy spoiled in War of the Spark for this deck. It would make counters and discard much worse against the deck and can utilize the graveyard even more without the use of Past in Flames.